Welcome to ASK AXE COP! This is your chance to ask Axe Cop any question, and if you are so fortunate, Axe Cop will address your query in an upcoming episode of his world famous web comic. You can ask him about his life, or you can ask him questions about his adventures. You can even ask him for advice if you are going through hard times. 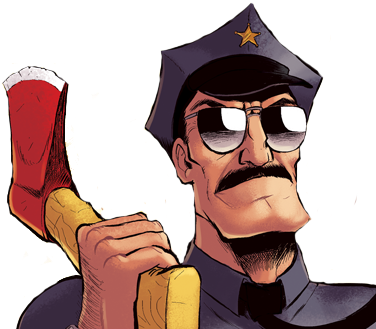 Whatever your question, Axe Cop is prepared to give you the best answer possible… or he will cut your head off. What does Axe Cop do on Vacation? How would Axe Cop stop dirty apes from taking over the world? What dinosaur would Axe Cop ride? How does Axe Cop confront a Rhino Man throwing rocks at kids?